Guillaume & The Coutu Dumonts, Russ Yallop, Sascha Braemer, Chroma & Inexcess, Dinky and more. 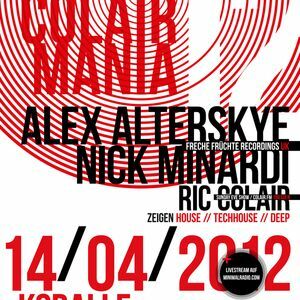 Live recording of June&apos;s Colairmania (#12) night at Koralle Club Dresden, Germany. Host Ric Colair started a funky house set and turned over to Alex Alterskye and Nick Minardi of Freche Früchte recordings UK. Amazing night with stomping tunes you better check out!